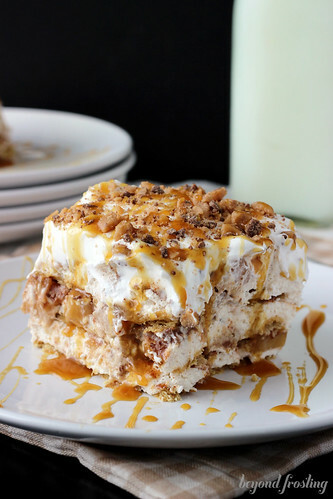 This Apple Pie Lasagna is a no-bake icebox cake that will be your new favorite desserts. Layers of graham cracker, brown sugar cream cheese, whipped cream and plenty of apple pie filling. It’s topped off with caramel and toffee. Seriously, put on your stretchy pants for this one! This is the original Apple Pie Lasagna. This post has been updated in 2016. Hey guys! I am kicking off apple week here on Beyond Frosting. I am pretty excited to be blogging during the fall season this year. I wrote my first post on Beyond Frosting on October 31st, 2012, so I am about a month and a half away from my one year blogiversary! Fall is my favorite season. Growing up in Vermont, it meant cooler days, changing leaves and the start of apple season. As a kid, I loved going to pick apples. They give you this long rake-like thing with a bag attached to catch the apples off the trees. You run through line after line of apple trees while towing a wagon with dozens of apples that mom would turn into something yummy! Sometimes I still ask my Dad to send me macintosh apple from Vermont. 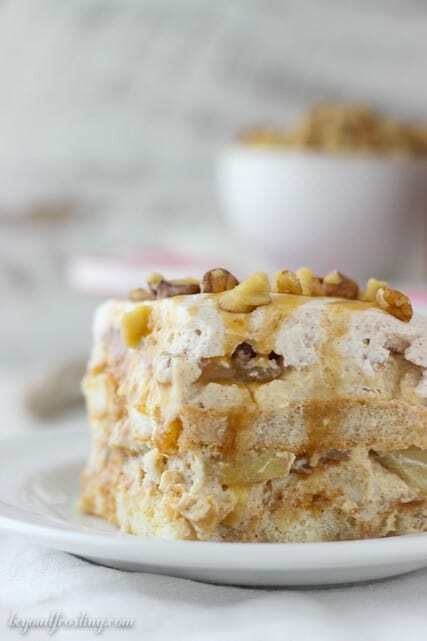 Today’s something yummy is Apple Pie Lasagna. This is insanely addicting. 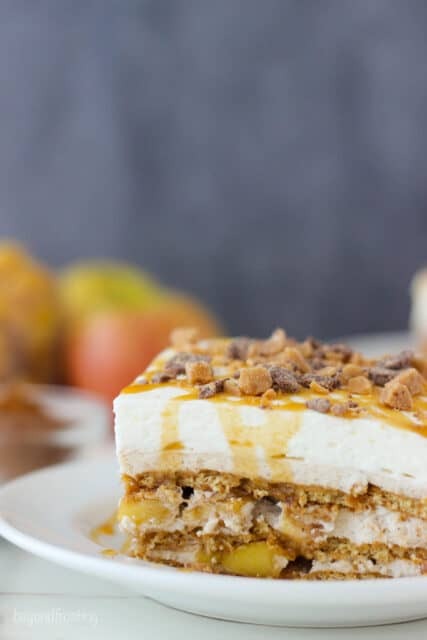 Just last week, I posted Pumpkin Pie Lasagna, and normally I would not post two similar recipes so close together, but the fact that these two desserts were some of best recipes that I think I’ve EVER made, I just couldn’t help myself. This dessert is really easy to put together and doesn’t require you to turn on the oven, meaning that is it NO-BAKE! 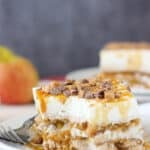 The Apple Pie Lasagna consists of layers of graham cracker, a caramel brown sugar cream cheese, apple pie filling, whipped cream and chocolate toffee pieces. The caramel brown sugar cream cheese is to die for, I could shovel it in my mouth by the spoonful. I’m not saying that I did that or not, but I am just saying that you COULD. I love the chocolate toffee bites because it adds in a little bit of crunch with every bite. I love apple pie filling, so I cooked mine on the stovetop, but you could use a can of pie filling if you choose. This is my go-to stovetop stovetop apple pie filling, which I use time and time again. It’s best to make the apple pie filling in advance so it can col completely. I originally used a deep dish 9×9” pan for this recipe, it was 3-inches deep and the filling came over the top. Therefore I do recommend that you make it in a 9-inch by 13-inch pan, which I have done time and time again. You’ll also be able to serve a large crowd. The key to a no-bake dessert like this is to build your layers with structure. What does this even mean? It means laying out your graham crackers in the most efficient way. Larger pieces are definitely better, and when it comes to adding the smaller ones, I use a serrated knife to cut them down. Your graham crackers will soften in the refrigerator, but that’s what we want them to do! 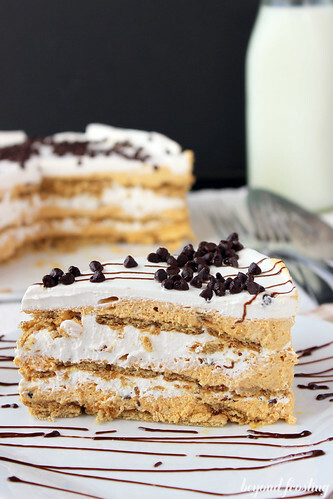 That way when you cut into this icebox cake, the graham crackers will be a cake-like texture. I also like to spread the layers as evenly as possible, and press the apples into the cream cheese layer below so that the crackers sit evenly. Usually on the second layer, I try and rotate the graham crackers so they are no all facing the same direction. Again, this helps to add stability and structure to the layers. This recipe is SO good, that I decided it had to be in my cookbook. No-Bake Treats features 80 no-bake recipes including cheesecakes, icebox cakes, layered desserts, frozen treats, bars and snacks and puddings and parfaits. Every recipe has a color photo with easy to follow instruction. I am not even kidding when I tell you this is the first thing to disappear off the dessert table. 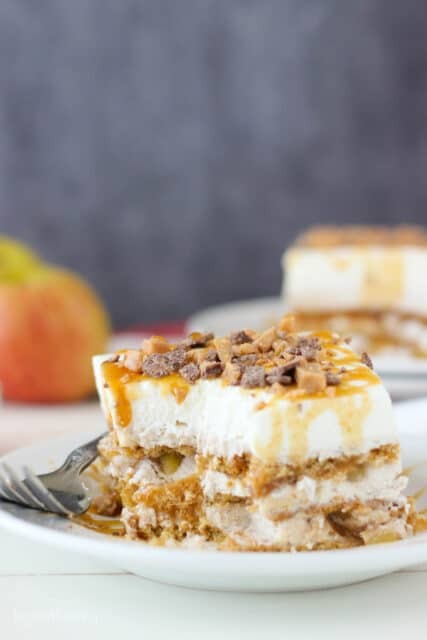 Don’t wait for fall, this dessert is good ALL year long! 5–6 medium apples, peeled and sliced. Peel and slice your apples into small pieces; about the size of a dime. Place in a medium size saucepan. Squeeze the juice from a whole lemon over the apples. Add all of your dry ingredients: flour, brown sugar, cinnamon and apple pie spice. Mix all ingredients well and then add maple syrup. Using a saucepan on medium-high heat, cook the apples for about 15-18 minutes until they begin to brown and bubble. Remove from heat and cool completely. Refrigerate if necessary. While the pie filling is cooking, prepare the cream cheese filling. Allow cream cheese to come to room temperature, or soften in the microwave for 15 seconds. 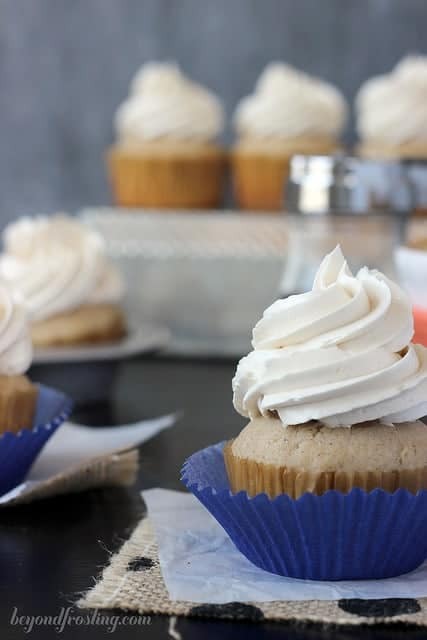 Beat cream cheese on medium-high speed with a wire whisk attachment until light and fluffy. Turn off mixer and add dry ingredients: powered sugar, brown sugar, cinnamon. Beat into cream cheese. Add heavy whipping cream and vanilla extract. Beat on medium-high speed until whipping cream is fully mixed into cream cheese. Add caramel sauce last and mix into batter. Add cool whip and beat on medium speed until mixture is well combined. Divide into thirds. 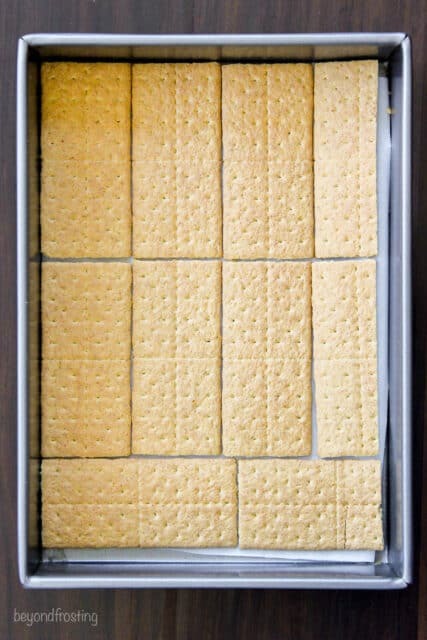 Cover the bottom of a 9-inch by 13-inhc pan with graham crackers. You can break the crackers into pieces in order to get into the nooks and crannies. Cover the graham crackers with a layer of the cream cheese batter and spread evenly. Spoon half of the apple pie filling over cream cheese and gently press into the mouse. Add a small handful of toffee chips on top. Repeat this twice so that you end up with three layers of mousse, 3 layers of graham crackers and 2 layers of apple pie filling. The top layer will be mousse. 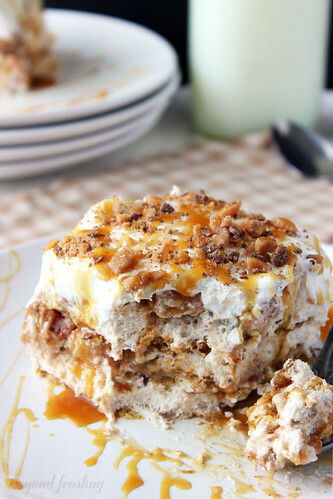 Cover the top layer of Cool Whip with additional toffee bites and drizzle with caramel. I suggest to allow at least two hours in the fridge for the graham crackers to soften. Store in an air tight container and keep refrigerated. Best served cold. I made this yesterday and it was absolutely delicious! The homemade apple pie filling was perfect. 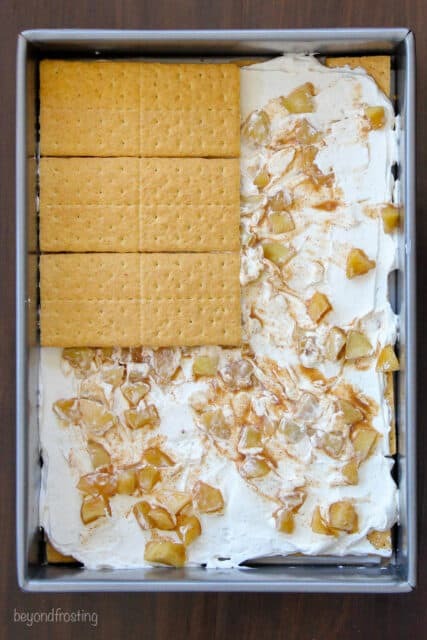 I could only fit 2 layers of graham crackers and 4 oz of Cool Whip for the topping. My glass 9×13 was filled to the brim! Next time I will also reduce the Cool Whip in the filling by half. Thanks for sharing your recipe! That’s awesome Heidi! I am glad you enjoyed it! Can this be made a day ahead or will graham crackers get soggy? Thank you. Hi Terri, actually the graham crackers are supposed to get soft and cake-like. You are more than okay to make this a day ahead of time. wow! Thanks for the step-by-step photos and video! I made this as one of my desserts for Thanksgiving this year. With the ingredients I thought it was going to taste too sweet. I was pleasantly surprised. It was light and creamy and wasn’t overly sweet. I made it in advance but found that the two layers of graham crackers did not get as soft as I would have liked. 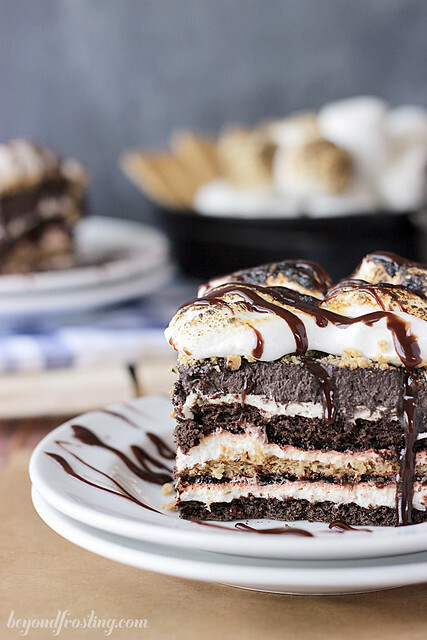 If I make this again, and I am sure I will, I plan to only use one layer of graham crackers. Thanks for a great recipe. Hi Karen, I am so glad that you stopped by to let me know your results! This recipe has always been one of my favorites! I hope you had a wonderful holiday. This was an amazing dessert for Thanksgiving dinner! Thank you so much for the great creation. It won much praise from my family. Thanks Deb! Happy holidays! I am SO glad you shared this for Thanksgiving! Hi Artis! I use green apples usually!